The luxury 3 bedroom apartment offers a spacious 110 square metres area. 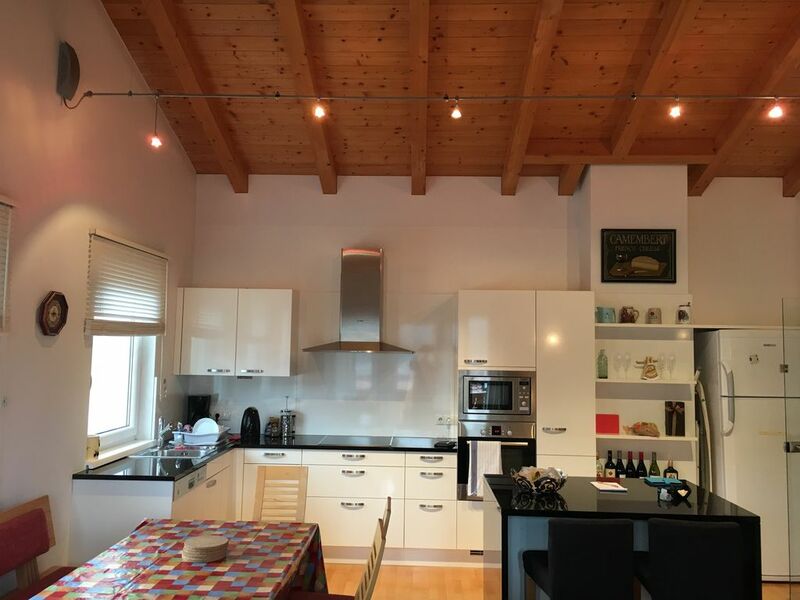 There is a modern open plan kitchen, lounge and dining area, with access onto a large balcony with sunny panoramic views over Flachau village and the mountains. There are 3 bedrooms (1 x master/en-suite and 2 x twin). There is a downstairs cellar with ski rack, boot warmer, washing machine and dryer. There is a covered car parking space directly opposite. The apartment is located just off the main slope above the Achter Jet Gondola station, hence providing ski-in/ski-out access. The picturesque village centre is only a 8 minute walk. The village has plenty of amenities (supermarkets, boutiques, sport equipment hire, hotels, bars and restaurants). Flachau provides both winter activities (a ski paradise) and summer (golf, hiking, touring, mountain biking, cycling, horse riding, white water rafting and tennis). Flachau is easily accessed just off the A10 motorway, only a 35 minute drive from Salzburg. We are from UK, and have lived in The Middle East since 1988, and see too much sand!! We love the contrast of snow in the winter and the beautiful lush scenery in the summer. We wish we could take more advantage of our beatiful apartment, but unforuntately we can't, but we hope that you will love it too. We are a family of passionate skiers, who love the outdoors and mountain scenery. Our apartment is ideally situated just a few metres off the piste giving great access to skiing or walking and wonderful views of the mountains and village below. It has been a been a long term dream to own a ski/mountain property. We believe that we have furnished it to high standards and have provided everything needed for an easy and hassle free holiday. We do hope that you love this apartment and location as much as we do, and keep it in the way that you found it, for all to enjoy for year to come. The Summers Family. There is something for everyone in Flachau. Skiing and snowboarding in the winter, golf, mountain biking, horse riding and hiking in the summer. For those of you that enjoy shopping, Salzberg is only a 30 minutes drive away. toilet, Separate toilet for use for the twin bedrooms. Large en-suite bathroom has a walk in shower, wc and heated towel rail. The second bathroom is fully tiled with bath/shower and heated towel rail. Separate wc. All bathrooms have underfloor heating. Bed sheets, pillows and quilts are provided for your stay. A large washing Machine and dryer are available for your use. They are situated in the cellar. One covered car parking space is allocated for Summerhaus guests. There is also a car parking area above the car park for additional cars. Covered garage situated opposite the apartment. A large bath twoel and small hand towel are provided for each person. The extendable dining table seats 8 adults comfortably. There are two large sofas in the lounge area, one of which converts to a double bed. There is a flat screen TV, DVD player and Ipod dock. The large patio doors lead onto a large wooden balcony. Large fridge / Freezer. Plenty of shelf and drawer space. Ceramic hob with large hooded extractor fan. Filter coffee drip coffee maker and french press down coffee pot. Basic pantry items such as salt and pepper, spices, sugar, tea etc are left for guests convenience. Crockery and glassware for 8+ guests. Bowls, cups and plates for children. The fully equipped, modern kitchen has granite worktops, oven, stove, refrigerator, freezer, microwave and dishwasher. It is fully equipped with crockery and cutlery for up to 10 people. Table with cushioned bench seating and 2 additional chairs. the table will extend if used for 8 people. There are also 2 additional covered stools at the island / breakfast bar. A new (April 2017) flat screen TV and DVD player has been installed. A variety of board games and Murder Mystery Dinner games are available. Cards, pens, and a small variety of children's games. A variety of English language movies and children's classic DVD's are available. A small communal garden with slide and swings. We have a table and 4 chairs for use in the summer. Flachau lies in the heart of the Ski Amade region which is rightly called 'Austria's Greatest Ski Paradise'. This is the world's largest ski area for a single lift pass, with a massive 850kms of piste, 360 lifts, 270 slopes, with 25 resorts and 5 ski areas. The apartment offers ski-in/ski-out access, lies 300 metres above the Achter Jet Gondola station, in the Salzbuger Sportwelt ski area. All of the 5 ski areas making up Ski Amade are within an easy 30 minute drive, or accessible by bus and some by rail! The 5 areas are as follows: Salzburger Sportwelt (250kms of piste). Schladming-Dachstein (200kms of piste). Gastein (200 kms of piste). Hochkonig(>150 kms piste). Grossarl-Dorfgastein (50 kms of piste). Plus other activities: Snowboarding (see the Absolut Park at Flachauwinkl). Cross-Country Skiing (714kms of slopes). Tobaganning, ice skating and curling, spas and swimming baths, snow walking, horse-sleigh rides. There are several 18 hole golf clubs within a 1 hour drive of Flachau. There is a 'Golf Alpin Pass' which gives you special rates across 30 golf courses in the Salzburg, Corinthia and Tyrol areas. The nearest Golf course is the Tauren Golf Course, Radstadt, only 10km from Flachau. This is a 5,962 metre, 18 hole, Par 71 course. Other nearby courses on the Golf Alpin Pass include: Lungaugolf St Michael: 5,470m, 18 hole, Par 72, Goldegg: 5,500m, 18 hole, Par 71, Bad Gastein: 6,000m, 18 hole, Par 71, Zell am See: 6,000m, 27 hole, Par 72, Kitzbuhel: 6,060m, 18 hole, Par 72, Millstatt: 5,027m, 18 hole, Par 71, Bad Kleinkirchheim: 5,400m, 18 hole, Par 72. Notes on accommodation: The apartment has under floor heating throughout. The apartment is suitable for families with children (including babies). There is a cot with bedlinen and a high chair. There are 2 additional single 'fold-up' beds (suitable for children) which can be put up in either the master bedroom or in the lounge. There is a Wi-Fi system for internet access (at an additional charge of Eu 35 per week). Outside: The apartment is in a quiet location, in a small development of several houses, overlooking Flachau village. The development will have a landscaped area. The large balconies provide a great deck area for both sun-bathing and for barbecuing. Utility Room: The heated downstairs cellar contains a washing machine, tumble dryer, ski rack, boot dryer and a variety of cleaning equipment and utensils. Cleaning / Towels / Linen / Maid service: Fresh bedlinen and towels are included. The property will be professionally cleaned prior to, and at the end of each let. Other: The underfloor heated hallway has a large built in cupboard for storage or for use by people sleeping on the sofa bed. There is a large shoe rack. We stayed with Colin and Mandy 3 seasons and really enjoyed it. The apartment is specious and cosy in the same time, well equipped and a few steps away from the Achterjet lift. The owners are very responsive and helpful with even small issues. An address to come back to. Thank you Kajetan for your kind words. We will miss you next year, but hope we are able to welcome you to Summerhaus again in the future. Wij verbleven met 2 gezinnen, totaal 8 personen. Op één van de slaapkamers waren 2 bedden bijgeschoven. Dat ging prima, dit is een kamer waar je niet veel hoeft te zijn. Een andere optie is dat 2 personen in de woonkamer op een slaapbank liggen. Het appartement heeft grote ramen en is hierdoor erg licht. Het balkon heeft tot 14.30 uur zon (in februari). Dit zal in de zomer nog langer zijn wanneer de zon hoger staat. In de kelder heb je een verwarmd hok voor je ski'is wat natuurlijk ook erg ideaal is. Daar staat ook een wasmachine en droger waar je gebruik van kunt maken. De keuken is prima ingericht en heeft alles: vaatwasser, oven, magnetron, waterkoker, koffiezet-apparaat, grote koelkast met vriesvakje. Om te skiën loop je binnen 1 minuut naar de piste en kun je zo skiën naar de lift Achterberg Jet. Op deze piste kun je aan het einde van de dag ook weer stoppen en ben je zo bij het huisje. Het dorp ligt direct aan de snelweg waardoor je er zo bent. Het laatste stuk weg naar het appartement is behoorlijk steil. Dus bij sneeuw of gladheid heb je wel sneeuwkettingen nodig. Naar de supermarkt kun je lopen in 10/15 minuten, naar de langlaufloipes met wandelpad erlangs loop je in 5/10 minuten. Dus prima te doen. We stayed 4 adults and 3 children in this great appartment. It had everything we needed. Good beds. Very clean. Near the pist and gondol. Easy to get in with the keybox. Nice view. Thank you for letting us stay here! we hope to welcome you back to Summerhaus soon!. We spend 6 nights at this very lovely, species, well equipped and very clean place. We had a great time. The owners and the management company were extremely responsive to all our needs (we had a problem with the Wifi that was fixed right away). We hope to come again - next time during the winter. Highly recommended. Very comfortabel apartment, only 200 meters from the Achterjet (red) slope. Large, luxury but cosy 3-bedroom apartment. We shared with two families with four children under 10 without a problem. Very close to the Achterjet lift, just ski an easy hundred meters down to the gondola after walking 200m to the slope (the red slope can be demanding from the top in warm weather conditions and is crowded at the end of the day, however with good snow last year even possible for our 7 year old niece). The living room is big enough to accommodate 8 people (though the kitchen table than becomes a little small), the master bedroom is big with bathroom en suite, the other two smaller rooms have 4 single beds and can share the other bathroom with bath and separate toilet. Enough storing spaces. Washing machine and dryer available. Ski boot warmer. Two hair dryers. Enough towels (you can wash them), nice showers and bath, comfortable couches, toys, DVD player, sledges and so on. Everything to make your (skiing) holiday a success!! Flachau is an ideal centre for activity holidays all year round, whether in summer or winter. As well as skiing and winter sports, Flachau provides hundreds of kilometres of marked hiking trails throughout the mountains and valleys. Many of the ski lifts remain open in summer, taking you up into some of the world's most breath taking scenery of mountains and lakes. Many mountain side restaurants provide fantastic food and hospitality. Mountain biking is very popular, take a lift up to one of the many mountains and enjoy biking down the trails. Or try cycling or white water rafting down the rivers. There are also several nearby swimming lakes, 2 within Flachau, which provide great family fun. For those of you who want to take in some culture, you are only a 35 minute drive to Salzburg, one of Europe's 'beloved' historical cities with castles, museums, theatres, opera, zoos and one of the most remarkable 'old towns' in Europe. There are several lakes within a 30 minute drive of Flachau and 2 swimming lakes within a 15 minute walk. The lakes provide for safe family swimming and bathing, with plenty of amenities around (restaurants, snack bars). Klagenfurt Airport is also close by, approx 100kms away and a 1 hour drive. Munich Airport is approx 200kms away, but it's a fast 2 hour drive, 'door to door' motorway all of the way to Flachau. There are taxi and bus shuttle services from the airports to Flachau. Car Hire is available from any airport and the local railway stations or main towns (e.g. Salzburg). Salzburg is the capital of the Salzbugerland area and is only 70kms from Flachau, which is an easy 35 minute drive on the A10 motorway. There are plenty of other historical and places of interest situated within a 50 minute drive: Wagrain, Radstadt, Altenmarkt, St Johann, Bad Gastein, Schladming, Zell am See and Kitzbuhel are all great places to visit. Flachau caters well for all types of visitors and holiday makers. There are plenty of restaurants offering a great variety of food: from traditional Austrian cooking, to Italian pizzeria, and modern far Eastern 'fusion'. There are also Fast Food outlets which will deliver to the apartment. There are 3 supermarkets all within a 4 minute drive, each offering well stocked and wide selection of foodstuffs, wines, delicatessen and household products. There are many other retail outlets: boutiques, sports equipment hire (e.g ski and bike hire), outdoor clothes outlets, and electrical stores. There are ATM machines available, and nearby petrol stations. The Flachau Tourist Board is situated in the village centre and provides plenty of information (in English) about local amenities and will help arrange any bookings or special requests for you. Altenmarkt is the nearest town, which is only 8kms away. Altmarket offers a wider selection of supermarkets and other retail outlets and banks. Booking Notes: Please email via below to make the booking. We require a security deposit of 250 euros per booking. This is held in case of damage or loss and subject to verificaton, this will be refunded within 2 weeks after vacating the apartment. A 50% deposit is required for each booking. The final payment is required 12 weeks prior to the arrival date. A local tourist tax of 1.2 euros per person per day will be added to the charges. Changeover Day: The 'normal' changeover day is Saturday. Check In time is from 3.00pm and Check out is at 10.00am. Please do contact us for any special requests for a different arrival and departure dates and times. Notes on prices: Prices are for the property per week in Euros. prices include bed linen, after stay laundry and cleaning. Wi fi and tourist tax will be charged seperately. Discounts available for 2 weeks or more from mid April to December. Special discounts available for the combined weeks during the winter season. There is a refundable security deposit of Eu 250 (in addition to the prices) which is to be paid with each booking and which is returned (subject to inspection) within 10 days of the departure date.